This list of best performing annuals certainly is not all inclusive, but is a good start in your search for annuals that are easy, grow well in poor conditions, or produce beautiful or unusual blooms. Problems associated with a plant are noted, just decide if it is a “problem” in your garden. Try something new in your garden this year! Agrostemma: 'Ocean Pearl' Sometimes known as Corn Cockel. A tall annual that makes a good cut flower, with five petaled white blooms. Other varieties available in bright pink/purples. Easy to grow even in poor soil, but may be invasive as they self seed heavily. To prevent self seeding remove spent blooms, which will also encourage additional blooming. Agrostemma makes a wonderful cut flower. 24-36", full sun. Alyssum: Low growing edging plant that spreads in a neat mound and blooms prolifically spring to frost. Fragrant blooms are white, blue or blue-violet, and prefers sun. May sometimes self seed, so you get some help on next year's edging. A few inches high, spreading up to a foot. Fairly tolerant of poor and dry conditions, but do best with good soil and moisture. Will grow well from seed, plants are widely available in garden stores. Anagallis monelli (or pimpernel): 'Skylover' A rare true bright blue, five petaled flowers with pink centers. Excellent for garden beds, borders and planters, blooming in late spring until frost. Will trail slightly. Plant in full sun, prefers regular fertilizing and moisture but can tolerate short drought periods. Cannas: This tropical plant is, of course, an annual in the north and midwest, requiring full sun in the northern garden. These tall and elegant flowers make a dramatic statement, even with only one plant. Up to 6' tall and grows into a large clump. Prefers a rich, well drained soil. Root clumps can be stored over winter, but not without difficulty. Cineraria: Beautifully mounded compact plants covered in flowers. It is actually a perennial grown in zones 8 and 9, blooming in winter, or a houseplant. In the Midwest Garden, of course it is an annual, preferring full sun. May be very hard to find, so if you run across them, pick one up. This gorgeous plant would be worth trying to save indoors over the winter. Caladium and Coleus: With so many new varieties of coleus, there is a color, size and texture for nearly any spot you need a bright accent. You will find interesting shaped leaves, speckly and spotty patterns, and colors from chartreuse to violet. Great for brightening shady spots, or to add color and texture to your pots in the shade. Known for their shade tolerance, many varieties also do very well in part to full sun. But don’t let them dry out too much, they like fairly consistent water, and sustained or high winds will dry them out. Pinch back to keep a nice mounded shape. Cosmos bipinnatus 'Picotee': Just one of the many fast growing, prolific cosmos, the ‘Picotee’ provides 80 days of flowers, white blooms outlined in red. Most Cosmos reseed themselves quite readily grow very quickly, and produce 3-4” double daisy-like blooms in pink, red, white and lavender.. Prefers full sun but will tolerate light shade, growing to 4' to even 6’ tall by end of season. Grows well from seed. Dahlia: Hundreds of varieties are available, from 1 to 5 feet tall, but the huge blooms of the dinner-plate dahlia are a show stopper. Dahlias require more preparation and care than the average annual, especially if you plan to store the roots for next year. Soil must be fertile, organic matter added annually for best results, and be moist but well drained. They need good air circulation, so don’t crowd them. Plant them 8 inches apart for dwarf varieties, and up to 18 inches apart for the tall 5 foot varieties. The eye of the tuber (growth bud on the thick root- think of an eye on a potato) should be 2 to 3 inches below the surface. If your dahlia came in a container, plant it at the same depth it was in in it’s pot. Dahlias can be grown from seed, started indoors 4 to 6 weeks ahead of 70 degree weather. Seeds will germinate in 5 to 14 days. Evolvulus glomeratus: The common cultivar is known as ‘Blue Daze’, but you may also find ‘Hawaiian Blue Eyes’. This is actually a perennial in zones 8-11, so it can be overwintered indoors. Here in the midwest and north it is a fantastic full sun annual for spilling out of pots and window boxes. Or if you prefer to encourage a more bushy plant, just pinch off the stems periodically. With hard to find true blue flowers, these vivid little buttons have white eyes to really set them off. ‘Blue Daze’ blooms continuously and profusely, but each flower only lasts a day (not that you will notice with so many blooms). They open in the morning and close in the afternoon. But mine seem to only close up in late afternoon early in the season or cloudy days. At present it is 8:45 pm, the sun will set in a few minutes, and the blooms are still wide open. However on heavily overcast days, I have found them all to be closed. Water thoroughly but let dry out somewhat between waterings, do not let them stay dry long or they will wilt. Evolvulus is pretty hardy and may tolerate light frosts. Geranium (Pelargoniums, Zonal): Geraniums are widely used, and for good reason. They are easily grown in moderately rich soil, and are great in formal beds, baskets, tucked in here and there in a perennial garden or for a bright spot in front of evergreen shrubs. Dead head and fertilize regularly (or mix in a slow release fertilizer when planted) to produce steady blooming. Plant in full sun for best results. Geranium, (Pelargoniums, Regal): A group that includes Martha Washington Geraniums, Regal Geraniums offer many color options not seen in zonal Geranium. Many are bi-colored in bright colors of varying contrast. Clusters of 2 or 3 flowers are produced abundantly with lush, dense foliage. Geraniums love to get hot and dry to produce the best blooming, so water well, then allow the soil to thoroughly dry out. Fertilize every 4 weeks and pinch out spent blooms to encourage more flowering. Gerbera Daisy: Also known as Transvaal Daisies, Gerbera produces a long lasting bloom that may be as much as 4-5 inches across. Blooms are produced for at least six weeks. Large green leaves form a mound. Plant in full sun for best blooming, but where heat is extreme afternoon shade will benefit the blooming. Gerbera prefers well drained soil with even moisture, but will tolerate drying out a bit. Gerberas love cooler temperatures and may bloom until frost in ideal conditions. Select plants with several buds ready to bloom. Pay attention to the stem length on the blooms, it seems that short stemmed plants will continue to produce short stemmed. For container planting the long stems may be preferred. Impatiens: Can't do without impatiens in the shade. They add an easy bright spot to even heavily shaded areas, and do very well in morning sun, and can handle a bit more sun if you don't let them dry out. Even in heavy shade you will get some bright blooms, but the plants will remain smaller and not bloom as heavily. Impatiens reach 8 to 24 inches tall, depending on how much sun they get, and will spread 10 to 15 inches. A number of color variations of pinks, reds, oranges and white are available. Plant them in masses, in pots or baskets, or tuck one or two in here and there. They will wilt and drop their petals in too much sun, and will need constant watering. Avoid the hot afternoon sun in particular and mulch heavily to retain soil moisture if they are recieving more than half day sun. 'New Guinea' impatiens are larger, sturdier, and tolerate more sun. Licorice: (Helichrysum) This non-flowering annual is a fabulous addition to hanging baskets or pots. Trailing soft silvery green branches pairs beautifully with bright ivy geraniums or verbena. Limelight is a lime-green variety. The Helichrysum is drought tolerant, but other plants you pair it with may not be. 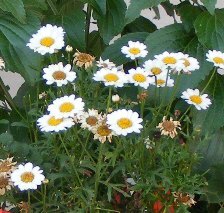 Marguerite Daisy: (Argyranthemum frutescens formerly Chrysanthemum frutescens) Also known as Paris daisy or Cobbitty daisy, the bright and airy 2 1/2” blooms are white, pink or yellow, and float atop tall stems. Deep cut leaves are dark green and aromatic when pinched. Blooms are produced all summer, but may slow down in extreme heat. Deadhead when blooms brown to produce heavier blooming. The plant grows to 2 or 3 feet tall and wide. Lovely in a border planting or as a container filler. Plant in full sun, afternoon shade is beneficial in hot climates. Fertilize every few weeks. Marigold: 80-90 days of creamy yellow, yellow, or yellow orange flowers. Sun lover, tolerates heat and neglect. Foliage is rich green and forms a neat mound, making them perfect for edging plants, tucking in among vegetable plants, or in container plantings. Marigolds grow easily from seed. There are many new hybrids with much different bloom “looks” and a variety of colors. Million Bells Petunia: (Calibrachoa) Very similar to Superbells, this is and excellent trailing plant closely related to the petunia, it blooms profusely. The blooms and plant are similar to a small petunia. They are ideal for spilling out of small pots or spreading to fill a small open space. When grown in ground the trailing plant will form a dense mat covered with blooms. You will find a variety of colors or multi-colored mixes, red, pink, blue, violet, yellow, orange, bronze, white. Million Bells will grow rapidly and healthy in loose, well drained, enriched soil or potting soil. They do best in full sun but will tolerate some shade. Requires minimal care, won’t deteriorate as the summer wears on, and no deadheading. Will tolerate neglect, and do not like to be overwatered. Superbells produce a bit larger bloom and a little more of a sprawling plant. Morning Glory: (Ipomoea) Nasturtium like flowers on a delicate vine. Older varieties’ blooms are open dawn to mid morning, but newer varieties hold their blooms open most of the day. The vines grow very quickly, reaching 10 feet or more. If the soil is too rich, the plant will put more energy into foliage and seed production, so for best blooming, plant in average soil. This self seeder should reproduce each year. Blooms for 70 days. New Guinea Impatiens: New Guinea Impatiens can take more sun than impatiens, but still prefer part shade, especially in the hot afternoon. Like impatiens, the New Guinea does not tolerate drought, so make sure they get enough water. Foliage is a deep rich green, purple green, or variegated. New Guinea Impatiens are relatively “new” to U.S. gardeners, they were introduced here in 1972. They quickly became popular for container gardens and hanging baskets, but their neat mounded form is also great as bedding plants. Petunias: This old favorite is new again, with many hybrids available. They bloom profusely all summer and are available from petite to sprawling. They are for the most part easy care, but look best with regular deadheading. For super full plants, pinch most or all the stems back about halfway within the first few weeks of planting. And if they get to "leggy", pinch a few stems back again. For an upright plant try Tidal Wave. For more mounded, compact plants use the Easy Wave. Most of the Wave petunias are best for hanging baskets, spilling out of pots or tumbling down a hilly landscape. But you can't beat the old fashioned Supercascade petunia for baskets - if you can find them! Selecting and growing petunias will give you complete information on the many varieties of petunias. Pinks Annual Dianthus: We generally think of Pinks as a perennial but many of them are annuals, especially in cold climates. Most are easy to grow from seed and grow quickly. Dianthus chinensis, China Pinks and Dianthus barbatus, Sweet William are both annuals in the midwest, and they love cool climates. They prefer full sun to light shade, but should receive some afternoon shade. Grow in well drained enriched soil and do not overwater but keep the soil moist. Deadhead to encourage reblooming, they will bloom from May to October. Some are tall enough to make an excellent cut flower. Many varieties are available with a wide range of colors and bi-colors. The “pinked” petal edges gave them their name. The annual pinks are very frost hardy. Sweet Potato Vine: (Ipomoea batatus) The large lime green heart shaped leaves of 'Margarita' or 'Terrace Lime' gives a bright lift to pots or baskets in light shade. 'Blackie' has rich purple-red textured leaves. This vine grows quickly, so make sure it has plenty of room to trail, or trim back. Tickseed: (Coreopsis tinctoria) Perennial coreopsis is commonly grown in the Midwest and North, but the tinctoria species is annual. Cross breeding annual and perennial coreopsis has also produced a greater variety of colors. Most common are variations of yellow and yellow orange, but the new breeds are available not only in a wide range of colors, but also some striking bi-colors. Pictured here is ‘Jive’ from the Coreopsis Big Bang series, very striking white petals with burgundy centers and an orange eye. The annual coreopsis plants produce long lasting daisy like flowers in abundance. They grow quickly and easily from seed in full sun and average well drained soil.